My daughter’s 8th Grade Formal is coming up this weekend. It is a fancy and fun dance, but more than that, it is a celebration of the end of middle school and the ushering in of high school. After getting all dressed up, we normally go up to our club and take pictures of all the teens before they go off to the dance. This year there is an event going on at the clubhouse, so my daughter and I went out to find another spot for pictures. We were thinking about going to a pretty field near our house, but as we passed it, we realized that amid all of the spring rain and renewal it had become overgrown and was no longer accessible to us. Looking into that tangled mass of new, green leaves and weeds I was reminded that a path only remains one by being exercised, tended to and cared for. Our lives so closely mimic that of the path in the woods. There are moments of clarity in our minds where we set out to forge new paths, or reconnect with old paths, or struggle to stay on the same path! It could be a New Year’s Resolution, a commitment for Lent, an academic or athletic goal as you enter high school or trying to stay the path you are on when obstacles try to crowd the way. 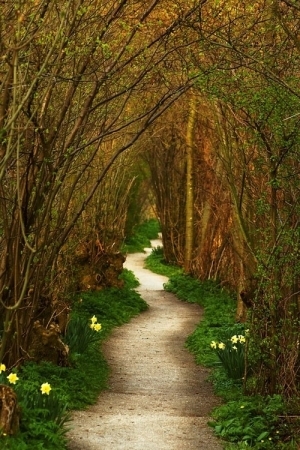 Some of our mental paths take form and settle into our daily walk of life. Some get overgrown with weeds and obstacles and end up being unusable. A single footstep doesn’t make a path and a single step in your mind’s path doesn’t make a life. Is there a pathway in your mind or heart that needs tending? Go there once and again and a clear walkway will begin to form. There is incredible beauty in beginning! The first step, the first breath, the anticipation of what’s to come… Eventually what once seemed impossible becomes possible and real. Is there a pathway in your mind that is already there? A well-worn comfortable place that you go back to again and again, like sinking into your favorite chair at the end of a busy day? Either way, repeating over and over our intentions with our thoughts and our actions will lead us down the path we are setting, as long as we tend to it, care for it and exercise it regularly. Grab your boots and hat and take a walk, one step at a time down that path!